80111 Private Thomas Smith, Canadian Expeditionary Force, 31st Infantry Battalion was killed in action 7 April 1917. He was 27 years old and is commemorated on the Ypres [Menin Gate] Memorial, Ypres, Belgium and the West Auckland War Memorial and the Roll of Honour in West Auckland Memorial Hall. Thomas Smith was born 17 May 1888 at West Auckland, the son of John and Mary Ann Smith. In 1901, Mary was married to William Coates, a 34-year old coal miner and they lived at Chapel Street with 12 year-old Thomas and Mary’s 76 year-old father, also named Thomas, a widower. In 1910, Thomas married Edith Florence Ventress. By 1911, they lived at 1 Leslie Street, St. Helen’s with their 1-year old son, Thomas. 24-year old Thomas worked as a brewery clerk. At some time after 1911, he [and family?] emigrated to Canada. November 1914: The 31st Canadian Infantry Battalion was formed under the command of Lieutenant-Colonel A.H. Bell under authorisation published in General Order 36 of 15 March 1915. The battalion was mobilized in Calgary and recruited in Edmonton, Medicine Hat, Lethbridge, Red Deer, Wetaskiwin, Youngstown, Claresholm and Pincher Creek. The battalion embarked at Quebec on 17 May 1915 aboard “Carpathia”, disembarking in England on 28 May 1915. Its strength was 37 officers and 1122 other ranks. By October 1915, the battalion was in the line south of Ypres, Belgium as part of 6 Brigade, 2 Canadian Division. Not until St. Eloi in April 1916 did the battalion suffer its first major casualties. The toll was relentless thereafter. The sector was an irregular line of at least 17 mine craters to the south of the devastated village of St. Eloi on the forward slope in full view of the enemy. It was exposed to artillery fire from the front and behind the left flank. Trenches had been severely knocked about, full of mud and water up to waist deep in places, with large numbers of dead and wounded. On the 4th April, 31st Battalion was ordered to relieve the 12/Yorks, 4/East Yorks and 7/King’s Shropshire Light Infantry. These men were in a state of exhaustion due to heavy bombardment of their positions. There was little accurate information available and no maps. Guides had difficulty recognising trenches due to recent heavy shelling. It was within this context that the relief took place. Enemy bombardment continued on the night of the 3rd and 4th through to 5pm. On the night of the 5th into the day of the 6th, enemy bombardment was heavy and continuous lasting last 17½hours according to the report of Major Daly in command of D Company. Private T. Smith served with D Company and they held their ground all day under heavy bombardment. All dug-outs other than 2 at position S19 were flattened. An estimated 150 Germans attacked No 4 crater but were repulsed by rapid rifle fire. Heavy rain fell during the night of 6th and 7th. There was no heavy bombardment – conditions were relatively quiet. Reinforcements were brought up after dark when it was considered to be safer and they were in position by 8.30pm, although another bombardment of extreme violence took place at 5pm – in comparison to others this was described as a quiet day. It was intended for D and C Companies to be relieved on the night of the 6th and 7th but this did not materialise. It was planned for the next evening but due to the poor state of the trenches resulting from previous bombardments, it was delayed until daylight. Shelling continued throughout the morning and afternoon of the 8th, increasing in intensity at 5pm., and then again at 7.30pm. Relief was finally completed by 11.15pm. 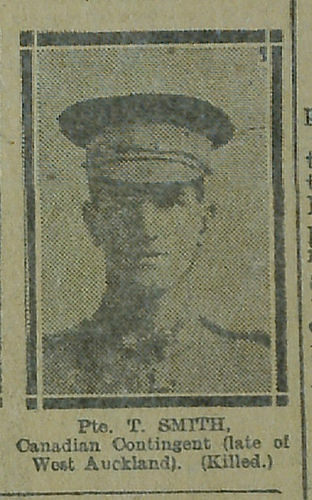 80111 Private T. Smith was killed in action 7 April 1916. He has no known grave. On that day, 446241 Private A. Attard, 79310 Private E. Loughborough, 446225 Private J. McWilliams and 434315 Private F.V. James serving in D Company were also killed in action. All have no known grave and are commemorated on the Ypres [Menin Gate] Memorial. It is assumed that Private T. Smith entered France before 31 December 1915 in which case he would have been awarded the 1914-15 Star, the British War and Victory medals. Private T. Smith is commemorated on the West Auckland War Memorial and the Roll of Honour in the West Auckland Memorial Hall. “31st Battalion C.E.F. 1914 – 1919” complied from its diaries & other papers by Major H.C. Singer. CWGC 434112 Private P. James is also recorded but I have not traced his burial/commemoration.